Spot marks the taX is a low power and secure location tracker to determine your residency for tax purposes. 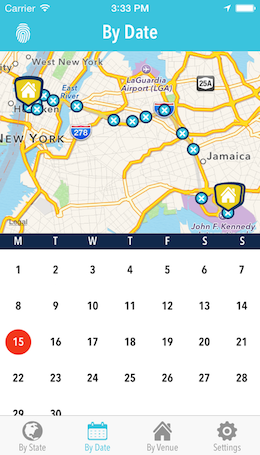 Spot uses your phone’s very low power location services to track your daily movements. It encrypts each fix and securely saves it to our cloud. Your accountant/attorney can then download this data as needed to address residency issues raised by state tax examiners. A location where you tarry for some time, say, your office. A location determined by cellphone towers. A highly accurate GPS fix authorized by a fingerprint. You have the keys; you have control. 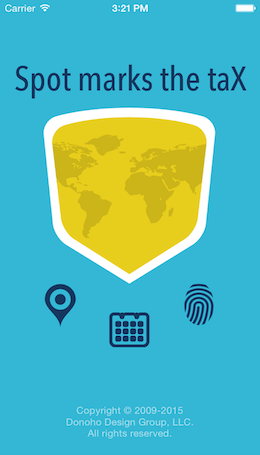 Our system, Spot and our servers, work together to certify where your phone traveled every day of the year without us knowing the details. It is a very cool trick enabled by the legally durable mathematics of modern cryptography. Spot’s Cryptographic Privacy™ implements the strongest privacy protections in the location services industry. Systems get hacked. Private data gets misused. Cryptographic Privacy avoids those risks. Our servers only have encrypted data. There is no “God mode,” where an employee can see your travels or sell your data. Hackers can only steal random bits. In order of increasing power consumption, Spot takes three kinds of location fixes: a Venue Fix, a Tracking Fix, and a Fingerprint Fix. Venue fixes have an entry time and a duration. For example, say you were visiting a client’s office for an hour long meeting. Spot would take a fix about 5-15 minutes into the meeting and a second fix roughly 5-15 minutes after you’ve left the office to declare a venue fix of your location, time and duration, perhaps for 67 minutes and 13 seconds. 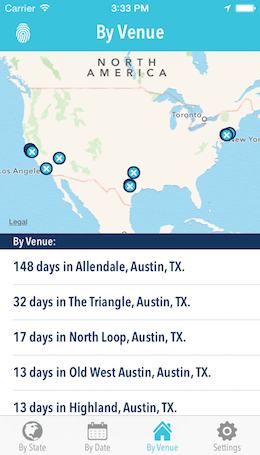 A Venue fix exploits Apple’s location database of both cell towers and Wi-Fi access points. While these are not as precise as GPS measurements, in practice, they are quite good. We believe that these fixes alone are sufficient to handle most tax residency issues. Consuming a bit more power are the optional Tracking fixes. These fixes are calculated when the phone switches cell phone towers. While they typically have an accuracy radius of about a kilometer, they are also, in practice, quite accurate in showing the progress of your day. Finally, a Fingerprint fix, which is taken by running the app and pressing the fingerprint icon in the upper left corner, uses the GPS to record your position with the highest resolution possible. When you need to prove that you have crossed that state line before midnight, the Fingerprint fix is what you want to use. Since its accuracy radius can be as large as 65 meters, more than half a football field long, make sure you are significantly past the state line when you take the fix. “X marks the taX” is our iPad app, XtaX, for your accountant. It allows them to track your whereabouts and generate reports for the tax authorities. While this app is not yet finished, the first version will be ready before 4Q2015. Your accountant will be able to test all aspects of our system before the 2016 calendar tax year begins. 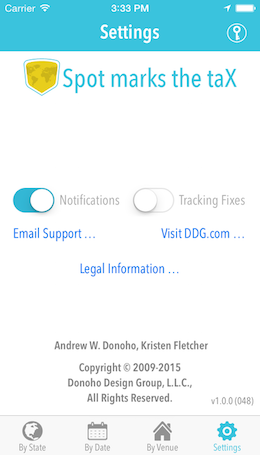 We are designing this app in conjunction with tax accountants and tax attorneys. All of your data is backed up on our servers. Until the XtaX app is available, your data can also be backed up for free to your Dropbox account. Your keys are backed up to iCloud and your other devices using Apple’s keychain technology. You can also take a screen shot of your keys encoded in a QR code. We recommend that you turn on keychain sharing with iCloud to have a backup of your keys. Spot, XtaX and our servers use an old school fee for service business model. 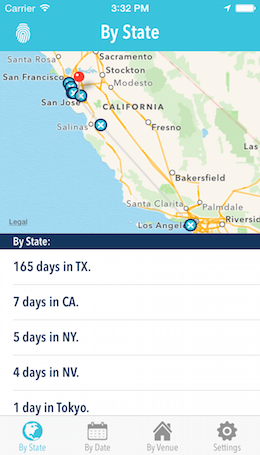 The tracking app, Spot, is itself free. If you wish us to certify your phone’s reported locations with our servers, that is a monthly service fee purchased through your accountant or directly from us. Finally, a printed and notarized location diary is available for a fee. The contents and format of the location diary can be configured in XtaX for each state.